That… is a tough reading, to be honest. When people talk about religion being the opiate of the masses, this is one of those readings that defies that thinking completely. Anyway, the Last Judgment has been a special focus of art by many people (I’ve featured one such painting by Bosch here), but perhaps the most famous depiction of the Last Judgment is by Michelangelo, which is located in the Sistine Chapel. Honestly, it’s in a bit of an odd place because it’s right behind the main altar. When I went to the Sistine Chapel during my honeymoon, I was quite shocked to see it there, as usually the scene behind the altar references Christ’s Passion… not His second coming! 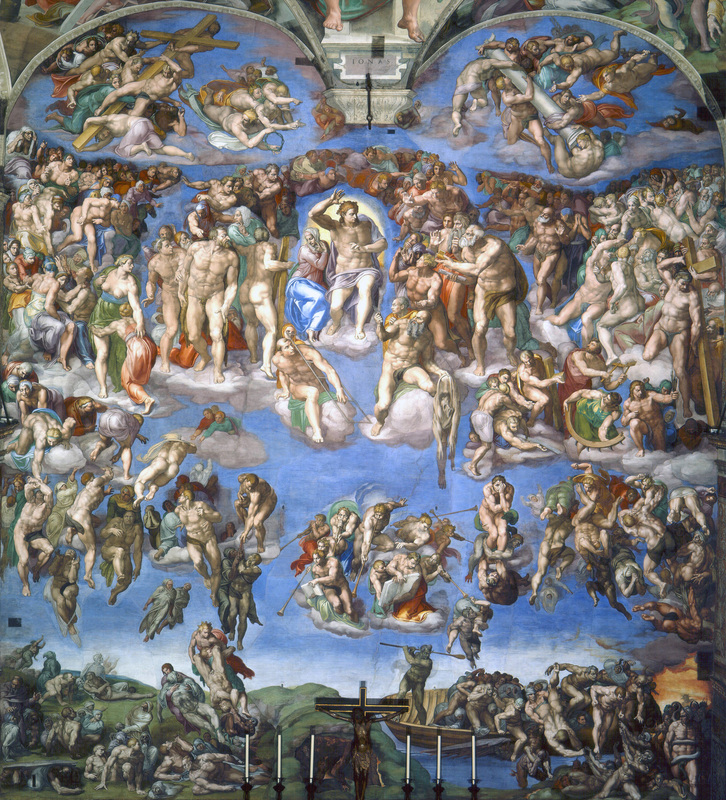 The Last Judgment, by Michelangelo, c. 1536-41. Sistine Chapel, Vatican, Rome, Italy. At the very top, angels bring forth a cross, a crown of thorns, and a column. The cross should hopefully be self-evident… that’s the cross that Christ died on! The crown of thorns should also be pretty evident… that’s Christ’s crown of thorns that the soldiers put on Him during His Passion to mock Him The column is a little more obscure, but that’s supposed to be the column that He was scourged on. The significance of this? Probably highlighting where Christ’s blood fell! Christ is in the middle, surrounded by saints and martyrs. Many of the martyrs are carrying reminders in their hands that show the way they died. For example, St. Bartholomew was skinned alive, so he holds a human skin. St. Catherine of Alexandria was killed by a breaking wheel which tortured her, so she is carrying that. Another saint is holding up a cross. The point of them holding up these objects? Probably to unite them with the cross of Christ! The woman to Christ’s right is Mary, the Mother of God. In other drafts that Michelangelo did, she was standing with her arms outstretched in a pleading sort of matter, since she intercedes for us. But, Michelangelo finally put her in the position she is, where she is beside Christ in a demure manner, looking at the souls that are saved. Why? Because this is the Last Judgment. There is no more time left for her to intercede — Christ must decide once and for all. So she follows Him. Just as the scripture goes, the people at the bottom on Christ’s right are being led to heaven. Some are being lifted up by (wingless) angels, others are awaking from their graves, still wrapped in their shrouds, to get up to go to Christ. The people near the bottom on Christ’s left are going to hell. Demons are dragging them down. There is lots of pagan imagery about the hellish part too, which comes partly from Dante’s depictions of hell and partly because of the classicism which was popular back then! St. Peter is giving back the keys to Christ. After all, there is no need for St. Peter to have them anymore, since the Church is united with Christ! Anyway! If you can, read more about this artwork! The history and symbolism is AMAZING, plus there’s tons of little stories involved. What can I say? This artwork created lots of controversy and intrigue back in its time, and still is utterly breathtaking today. Trust me on this. Look closely at the artwork. What particular scene drew you in the most? What symbolism spoke to you personally and intrigued you the most? Look carefully at the expressions of their faces. Which person did you identify with the most? Let us always honor You as the Lord of the Universe. Be merciful with us when we approach You in our final judgment. Next Sunday is the first Sunday of Advent! If this excites you, you might be interested in buying my book about the Joyful Mysteries!